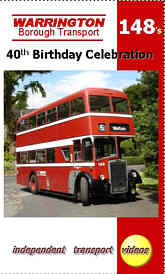 independent transport videos invite you to a special Birthday Celebration. Warrington Borough Transport’s 148 (originally 48) was 40 years old in May 2005. It is a 1965 Leyland Titan PD2/40 special with East Lancs H64F bodywork, built to a special width of 7ft 6ins so as to fit the narrow town centre streets of Warrington. Registered BED 729C it has the distinction of still being owned by the undertaking, although now only used for special occasions and private hire work. A group of local enthusiasts thought it would be a good idea to take 148 out to relive some of it’s former routes, so the date of 29th May 2005 was chosen as it is as near as possible to the date it entered service some 40 years previous. Driven expertly by Dave Leigh, who incidentally is the company’s driving instructor, 148 was put back into ‘service’ to recreate some scenes from 1965. The weather was excellent, bright sunshine enhancing the beautiful Cheshire countryside, and brightening up the more urban areas of which 148 would have been at home during it’s days in regular service. We set off from the W.B.T. garage at Wildespool Causeway and head out to Appleton Thorn. We pay a brief visit to A1 Travel and see 148’s former shed mate 24 (EED 8) which is in preservation. Heading onto the Hatton bus turning area via Stretton and Hatton village. From here we go via Dudlows Green, Lower Walton to arrive at the Walton Gardens bus turning circle. Then back to Warrington via Thelwall village and passing over the Manchester Ship Canal on the Knutsford Road swing bridge. From the garage we visit the soon to be demolished bus station for a couple of runthroughs! We then head out past the Town Hall’s Golden Gates to Dallam. From here we take 148 on the old Liverpool Road past the Crossfields factory, a road use by most Warrington and Crosville services. Finally we visit the Westy area and then return 148 back to the garage. To finish off the programme there is a section on the current bus scene in Warrington.